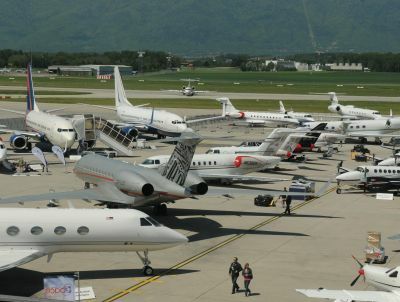 The big aircraft orders of yesteryear may have been missing, but last week’s annual European Business Aviation Convention and Exhibition (EBACE) didn’t fail to disappoint exhibitors and visitors. There was a distinct international flavour too this year with new initiatives such as the founding of the African Business Aviation Association and a tie-up between Qatar Airways and Bombardier’s fractional partner FlexJet announced here. Airline boss CEO Akbar Al Baker flew in to announce the partnership whereby the carrier’s premium passengers flying from the Middle East to its North American destinations (Houston, Montreal, New York and Washington DC) will have the opportunity to charter FlexJet’s 50-strong fleet of Challenger 605 and 300 business jets, in a unique deal with Qatar’s expanding business jet division, Qatar Executive. Al Baker also disclosed that Qatar Executive was in talks with Bombardier regarding firming up a Letter of Intent for 10 new Global 7000s and 8000s. Now in its 12th year, EBACE has become a firm fixture for those, primarily in the EMEA region, looking to do business and network. The show welcomed 12,638 visitors from 99 countries – similar to the previous year – despite the new Sunday to Wednesday format (owing to the Ascension Holiday). Out on the static 60 aircraft were on show in an area 10% larger than previous years. A total 491 exhibitors occupied a record-breaking 2,280 booth spaces in Halls 5, 6 and 7 of the Geneva Palexpo Centre venue. Importantly, the gathering presented an opportunity to voice the challenges EBAA’s 500-plus members are facing to influencers and EU officials. 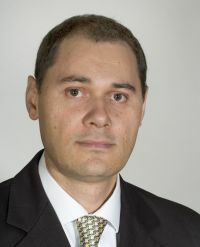 “This year is going to be a pivotal year in the European theatre,” Chief Executive Fabio Gamba warned earlier at a pre-show press luncheon, sponsored by Dassault. With a general mood of ‘cautious optimism,’ the theme of this year’s EBACE was ‘flying the return to growth.’ Policy makers were called to the opening session of EBACE 2012 to hear that proposed new rules on airport slots – due to be voted on in September, ETS (emissions trading) – discriminatory and confusing and the fierce taxes being imposed by certain cash-strapped European governments – are all conspiring to hinder industry growth. Officials were reminded that business aviation contributes €20bn annually to the economy and generates €5.7bn in salaries and wages. Ed Bolen, US NBAA President, further warned that ETS, already threatening to spark a trade war following decisions by the US, Russia, India and China not to comply with the scheme, will also harm US Part 91 bizjet operators flying into Europe. 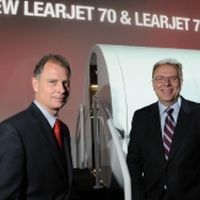 Highlights from the manufacturers included Bombardier’s announcement of two new models, the new Learjet 70 and 75, successors to the iconic Learjet 40 and 45XRs, but more significantly underlining the manufacturer’s belief that the light to mid-sized business market (sluggish compared with the super mid/large jet market) will make a strong recovery. Both aircraft, with a 2,000nm range and more powerful new Honeywell TFE731-40BR engines, feature significant cabin upgrades over the existing models. The new aircraft are set to enter service in 2013. Tellingly, these two new aircraft are the first brand new models Bombardier has launched at an EBACE Show. It usually unveils new aircraft at the larger NBAA Show. But with the RoW (rest of world) taking over from North America now in terms of new aircraft deliveries, EBACE has grown in stature. Cessna too announced it was offering a stretched version of its new midsize cabin Citation Latitude, the Longitude, and the largest jet yet in the Citation family. New President and CEO Scott Ernest pledged the aircraft will be able to fly 4,000nm at Mach 0.82. Maiden flight will be in three years’ time. But when it came to speed, Gulfstream played the ace card this year, flying its all new ultra large cabin, ultra long range Gulfstream 650 to Geneva to mark its European debut. The aircraft flew an unconfirmed record flight of 3,780nm miles (7,000km) from Washington Dulles in just 6hrs 55mins, cruising at Mach 0.90 to Mach 0.92 throughout. First customer deliveries are due this year. Hawker Beechcraft reassured customers, suppliers and media here that it was business as usual despite its recent Chapter 11, protection from creditor status. To prove a point it announced new UK Service Centre agreements with Gama Aviation and Harrods Aviation for its King Air/Premier and Hawker business jet series, respectively and led the pack with order announcements trumpeting contracts for 11 aircraft, including three Hawker 4000 super-midsize business jets, a Hawker 400XPR, six King Air 350i turboprops and a King Air 250, worth more than US$120m. Business aircraft operators took the opportunity to air their news about new ventures and bases. Farnborough, UK headquartered Gama Group announced the establishment of a Swiss base in Geneva and the opening of an office in Hong Kong where it is positioning to offer aircraft charter and management opportunities. Sister company Gama Engineering also showcased its new Infant Seat – the only one in the world certified for take offs and landings on most business jets. 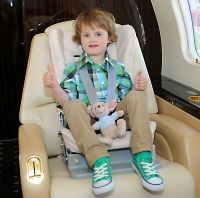 William Gordon, aged three and a half, and EBACE’s youngest visitor demonstrated the seat’s comfort and safety value aboard a Challenger 300 out in the static. Exhibiting UK business aviation airports attracted interest from visiting operators and charter brokers keen to hear about their preparations for the Olympics. Northolt Airport stressed it wasn’t just restricted to Head of State flights only, Southend highlighted its closest proximity to the Stadium, Oxford Airport was exhibiting with London Heliport for the first time, now under shared ownership, and talked up synergies and financial incentives of selecting the two bases. Chauffeur company First Class Cars announced the opening of a base at Farnborough Airport this month where it will support clients coming in to both the airport and staying at the adjacent Aviator hotel, which reports brisk business for July’s air show too. The TAG-owned airport, which has just opened new office and hangar facilities, is confident it will pick up a third of the additional 3,000 business jet movements anticipated over the period of the Games. Marshall Group-owned Cambridge Airport too, one of a handful of regional airports to be open 24/7 during the period, was at EBACE talking up planned further development on the south side of the airport. Its FBO partner ExecuJet Europe held a Pimms party on its stand to celebrate six months at its new UK base, where it now employs 45 staff having started to transfer its operations and dispatch from Zurich to the UK. Switzerland’s business and charter management company Perfect Aviation SA is also bolstering its presence in the UK at Biggin Hill, having added two more aircraft – a Learjet 45 and Challenger 605 – to its managed fleet. However, CEO Will Curtis is encouraging his clients from the Europe and Russia to fly to the Med instead this summer. He believes UK-based operators will likely be disadvantaged operating from bases lying within heavily restricted airspace. As usual, business aviation interiors were a big interest at EBACE. Flying Colours of Canada exhibited at the show talking up its most ambitious CRJ 200 conversion project tshower which when completed to ExecLiner configuration will feature a bedroom, shower and office and state-of-the-art IFE including high speed internet through Viasat Ku Band. “Clients coming to us want an aircraft personalised to their requirements so they can achieve the benefits of a wide body jet but at a competitive price," said Eric Gillespie, Director and Project Manager.